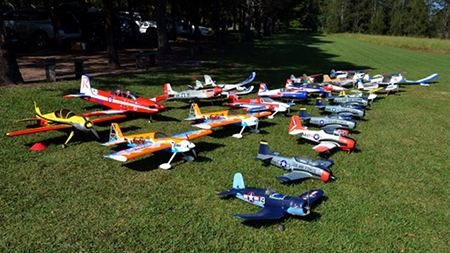 The Hornsby Electric Model Flying Club was founded in 1996 and is a group of like-minded people who love to build and fly electric model aircraft. We meet at Fagan Park, Galston, in Sydney's north west. We do not run competitions as we enjoy the social interaction of meeting and swapping ideas. Please feel free to browse our gallery of photos and videos and read our flying guidelines. If you wish you may contact us. Do you recognise this person ??? If you do, please click HERE for more details. The membership fees for this financial year are now due. Your 2017-18 membership expires on 30th June and you may not fly at the field until you renew. Please note that you must be financial to fly (insurance and legal reasons). Click here for fee details or click here for membership details. The 2018 AGM will be held on Sunday 1st July 2018, starting at 10.00am, at the airfield. As usual the AGM will be followed up with a BBQ and include a swap/buy/sell meet. The 2017 AGM was held on Sunday 2nd July. The minutes of the meeting are available here. A video of the field is available on YouTube. Have a look at all the videos on our movies gallery or watch just this one on YouTube. There are a number of apps for smartphones to help you find RC airfields. You could try these for Android and iPhone.